When it comes to cryptids, there’s not a lot of new animals to discover. Most of the ones that get talked about are the traditional ones, or variations on the traditional. However, there is one cryptid which can be classified as fairly new, and that is the legendary chupacabra. This creature, given a Spanish name meaning “goat sucker” was first reported in 1995 in Pueto Rico, where it was blamed for killing and draining the blood from 8 sheep. 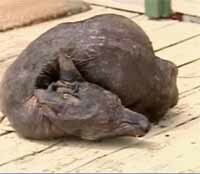 Well, a man in Texas claims that he has the corpse of a chupacabra that was rummaging around in his friend’s barn. If you follow the above linked site, the corpse recovered looks, well, like a big hairless hyena or a dog that has been turned into canine jerky. It has leathery skin, pronounced canine teeth, and no hair, kind of like if a dog and a bat could have a very ugly baby. I don’t believe it’s the Latin Bigfoot, but if people are reporting cryptids rummaging around in their backyard or washing up on the beach, I will always pass it on. Even if I don’t believe it myself. The fact that there’s a rush to get the creature stuffed and mounted at the Blanco Taxidermy School suggests that it’s a hoax. This time. One of these days, I’m pretty confident they will find some unexplained animal that looks and behaves like the Chupacabra or a Yeti. That corpse above might not be it, but that doesn’t make it any less creepy and awesome.